This evening I wanted to check a point of Greek grammar, so I went to my “black library”, where the Greek and Latin grammars are stored. My study is in a converted bedroom, which has the floor-to-ceiling sliding mirrored doors that were fitted in the 90s. Inside this are not the clothes that such wardrobes are designed for, but shelves, at least at one end. Upon these shelves stand books that I don’t want to see when I am weary or on holiday; which is why I call it the “black library”. It used to contain a wide selection of computer manuals. It does so no longer. These days nobody reads such books, and all the materials are online, often on YouTube videos. Only a dozen or so remain, most of them in case I need to relearn some older skill. The rest have long since gone to a charity shop. It also contains computer equipment, and my language books. The Latin books I found easily enough. Some were copies of schoolboy Latin texts, familiar to me from my schooldays, and so worth having for that reason alone, to prompt errant memory. Most were purchases from the days when I was developing QuickLatin. But where were my Greek books? I could find none at all. I was looking vaguely for a basic grammar of NT Greek, which I knew that I had. But no luck. I was taken aback. Where could they be? After some time, my tired brain offered up a faint memory. I dimly remembered a decision to dispose of them, of deciding that I would never look at Greek again, and of the need for more space and fewer books. How I disposed of them I could not remember. Did I give them to a charity shop? I suspect that I did. But gone they certainly were. In truth I know that I hardly ever looked at any of them. Maybe it was a good decision. I hate clutter, and I have too many books. One book alone had survived, mainly – I recalled now – because I remembered annotating it when I was developing QuickGreek, and thinking that it was splendidly clear, comprehensive and concise. 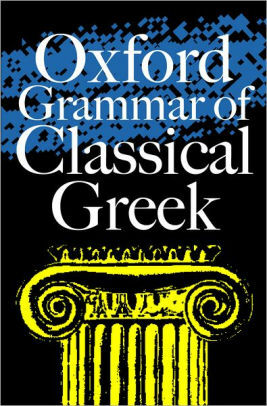 It was James Morwood’s Oxford Grammar of Classical Greek (Oxford, 2001). Off to bed I went, and turned it over in my hands. Excellent it is indeed. The first half was devoted to grammar; the second half to syntax. I swiftly found the point I wanted, which – fortunately for me – was in line with my understanding. As I handled it, a yellowed till receipt fell out from underneath the front cover. This told me that I bought it in Cambridge, in Heffers Bookshop, together with two other books, for £9.99, in 2001. Dimly I recalled making the purchase, downstairs in their classics department. It seemed an age ago. In those days I was quietly full of optimism. My trips to Cambridge were a joy, usually undertaken in sunshine on a day-trip. I would park at the university library, and photocopy articles. At lunch I would walk into the city centre and buy books, and not a few of these. The terrible experience of my first and only full-time job – fourteen wasted years of covert bullying, stress, sickness and misery – was behind me. For four years I had worked successfully and happily as a freelancer. The Tertullian Project was well underway. QuickLatin had been written during 1999. Most of it had been written in Microsoft Access in idle office hours on an incredibly misconceived government project that should have been completed in three months, but was running seven years late. In 2001 I was starting to work on the never-to-be-finished QuickGreek project. Books I needed, and Amazon was in its infancy. Trips to Cambridge, and visits to its academic bookshops, were a delight, for it served to remind me of my Oxford days, a time when I was really very happy. Seventeen years have passed since then. They were good years, at least compared to those that went before. I remember mostly sunshine. They have passed very swiftly indeed. It’s interesting to see that the book today is actually sold for less on Amazon UK than I paid for it 17 years ago – a mere £7.86 today in the UK ($15 on Amazon.com), and free postage with Amazon Prime. How fortunate we are, to have Amazon. The author, James Morwood, is dead, I see. He was master of Wadham college, and he died last year. This is a pity, for otherwise tonight I might have written to thank him. It is indeed a fine, concise work. I do not think that I shall buy back the lost Greek books. These days much is online. Still, looking for them brought back happy memories. Those of us whose life is in books can always use more of those.